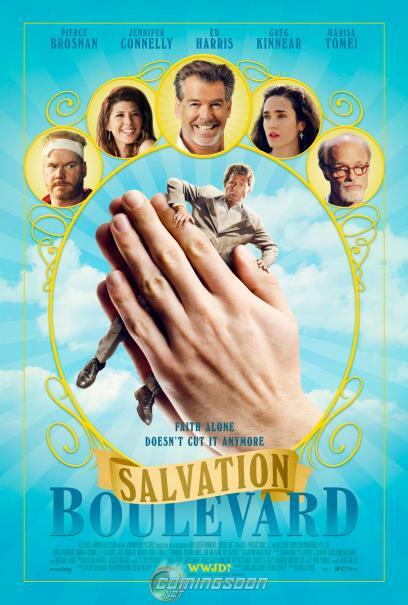 "Salvation Boulevard" is a modern comedy based on the book of the same title by Larry Beinhart ("Wag the Dog") about Pastor Dan Day, a charismatic evangelical preacher (Pierce Brosnan) who has captivated a small western American town with his charm – and the promise of a sweet real estate development. Carl (Greg Kinnear) is a former follower – not of Christ, but of the Grateful Dead – who has since become "found" in Dan's Evangelical community, serving as one of the preacher's great examples of spiritual and moral transformation. But Carl's new belief system is turned upside down when he witnesses a sinful act that Pastor Dan's doughy henchman (Jim Gaffigan) aims to cover up. In the meantime, Carl finds himself on the run, torn between Honey (Marisa Tomei), a security guard who still follows the Dead and partakes in those pleasures, and his militantly devout wife (Jennifer Connelly, as you've never seen her) and her daughter (Isabelle Fuhrman), who is herself on the eve of taking a vow of sexual purity.